I had been looking forward to the Country Night at Al Shaheen and to see and hear Devon (Mr Rodeo) performing. I was not disappointed, it was a great evening and Simon Burridge (aka Mr Rodeo) was in terrific form and gave a very energetic performance, in fact by the end of the evening his T-shirt was soaking wet. Simon encouraged the audience to participate, which they did, and there was a lot of dancing to both country and rock and roll songs. 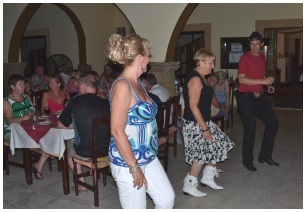 Some of the Phoenix Line Dancers were there to enjoy the evening and they took to the floor on many occasions giving us all a taste of how line dancing should be done and they were extremely good. Imtiaz and Ashraf were both there to greet their customers and from the time we arrived both of them, and their staff, were dashing around serving food and drinks and this did not stop all evening, they all worked so hard but I think they all enjoyed the entertainment as well. 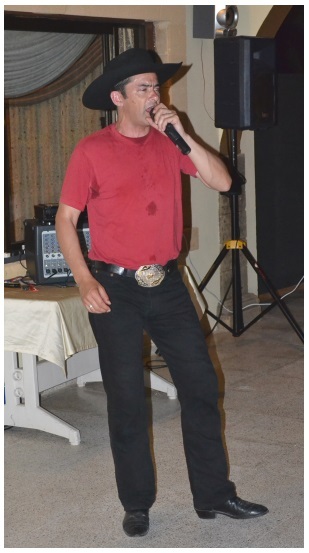 Mr Rodeo started his performance and apart from a very short break he sang all evening and we enjoyed songs like Rhinestone Cowboy, Achy Breaky Heart and many more popular country songs as well as popular rock and roll songs and a few requests from the audience. We were a party of 4 and we had a lovely meal which was a choice from either the a la carte menu or a set menu which had a choice of 6 starters and 8 main courses so no problem in being able to make a good selection. There were 75 diners that evening and about half a dozen people who had come in to have a drink, so the staff had a lot of work to do but I must say we didn’t have to wait for our order to be served, everything was perfect and very well organised. 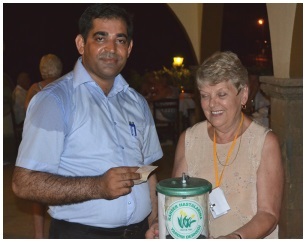 Imtiaz & Ashraf had been pleased for the event to include fund raising for Help Those with Cancer Association – Tulips and while Mr Rodeo took his short break, Chris and I, as official fund raisers for Tulips, mingled with the diners to collect donations for this very worthy cause. The box was taken to Tulips the following day and the grand total collected for the evening was 480 TL. Thank you everyone for your generosity, thank you to Imtiaz and Ashraf for their support and also thank you to Mr Rodeo who donated 5TL from each of his CD sales at the end of the evening, a lovely gesture. 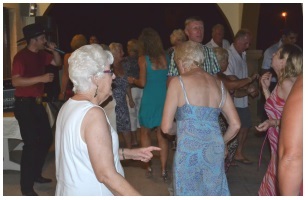 So, the evening continued with more songs and more dancing and I think everyone thoroughly enjoyed themselves, it was a lovely atmosphere and Mr Rodeo really drew out the best from his audience, he mingled with the diners and with his continuous dancing, singing and ad-libbing he had everyone’s attention throughout the evening. I spoke with Simon – Mr Rodeo, when the evening came to a close and he gave me a bit of information about himself. He has been singing country music for about 18 years and performs locally as well as all over the UK, also Europe where he performs in various countries including Holland and Belgium and he has a forthcoming event in Paris which he is really looking forward to. Simon was in North Cyprus for just a short break but had been asked to do 7 performances at different venues, including Al Shaheen. His base is in Barnstaple, Devon, where he was born and where he now lives but he previously spent 18 years living in Holland and 4 years in South Cyprus. Simon came to North Cyprus 2 years ago and did a number of performances then. He says he will be back maybe next year and I am sure there will be many people who will be pleased to see him perform again, so don’t leave it too long Simon, we all look forward to seeing you again. 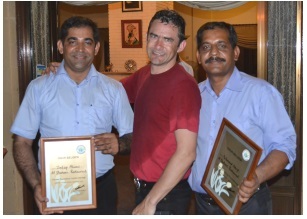 Well done Al Shaheen, a lovely evening with good food, good company and first class entertainment. 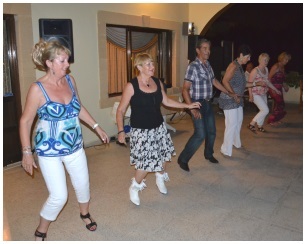 This entry was posted in Media reports, Special Events and tagged Al Shaheen Restaurant, Entertainment, Help Those with Cancer Association (Tulips), Karakum, Mr Rodeo, North Cyprus, Phoenix Line Dancers by kyreniacatkin. Bookmark the permalink.